I collect Hard Rock Café t-shirts. There is a wall in my house where the entire collection is prominently displayed. The story of how the collection got started is interesting in and of itself. You see, a few decades ago, I was living overseas. One evening I was feeling particularly down and homesick. I happened to be in London that evening, and as I walked the city’s rainy streets I stumbled upon what I thought to be an American-themed restaurant. Dining in the confines of familiarity seemed like a good idea, so I went in and sat down. Obviously, that establishment was the Hard Rock Café-London, and it did indeed turn out to be the perfect remedy for my blues. As I sat at my table listening to the loud music and eating what I recall to be the most savory burger I had ever tasted, a warm feeling seemed to envelope me. My stress had dissipated. I was happy. In fact, I felt so happy that I wanted to capture the essence of the moment. On my way out of the restaurant, I stopped in the gift shop and purchased a classic white Hard Rock Café t-shirt with the word London printed on the front. In doing so, I connected a good memory to a good emotion. I loved that t-shirt. It quickly became my favorite article of clothing. I think I wore it everywhere I went because, at least subconsciously, I associated it with the feeling of happiness. That shirt became my happy shirt. Over time, my London shirt started to become worn and frayed, as cotton t-shirts tend to do. One day, a few years later, I walked by a Hard Rock Café in Atlanta, so I stopped and had lunch…and bought another shirt. I subsequently did the same thing in Toronto. And in Pittsburgh. And in Washington, D.C.
Before I knew it, I had started a collection. When the London shirt became so frayed that it was too fragile to wear anymore, I put it in a frame and hung it on the wall. My happy shirt became my happy picture. I have acquired dozens of Hard Rock Café t-shirts since then. I don’t even try to wear them anymore. I now put them straight into a frame and add them to the wall. Having a collection of anything can be good for the soul. It can offer a visual cue to our past, a reminder of where we’ve been. It can also give us something to look forward to. My Hard Rock Café collection certainly does that for me. I remember the details of obtaining each and every one of those t-shirts. My collection represents the adventures of my life and where my travels have taken me. 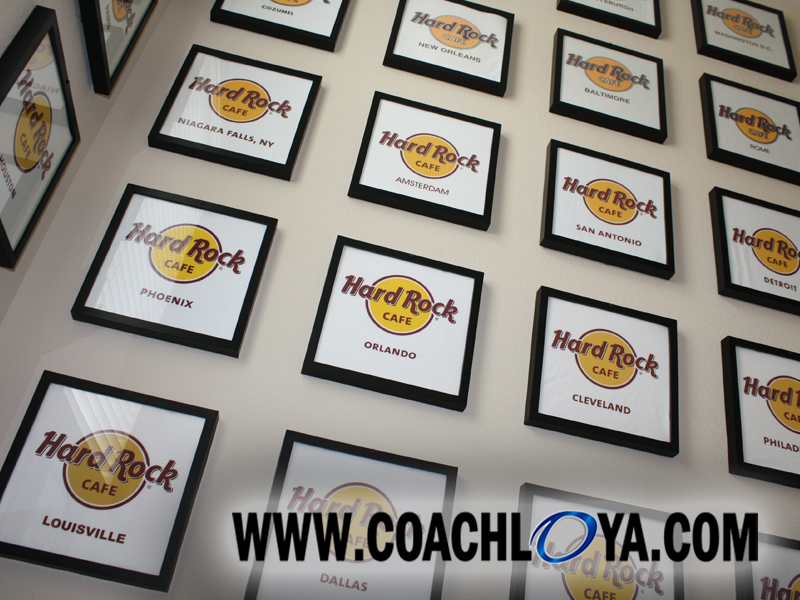 Lots and lots of memories are captured in those framed shirts. I enjoy looking forward to acquiring my next shirt and wonder what adventure will accompany that acquisition. My collection fuels my life’s journey. Which brings us to the Aruba shirt. Last year, my wife celebrated a milestone birthday. (I’ll be a good teammate and not disclose which milestone it was!) To celebrate the occasion, we took a trip to the Caribbean island of Aruba. Neither of us had been there before and we had heard wonderful things about the location. In full disclosure, I may have had a “mild” ulterior motive in choosing Aruba, since it also had one of the few Hard Rock Cafes I had yet to visit. 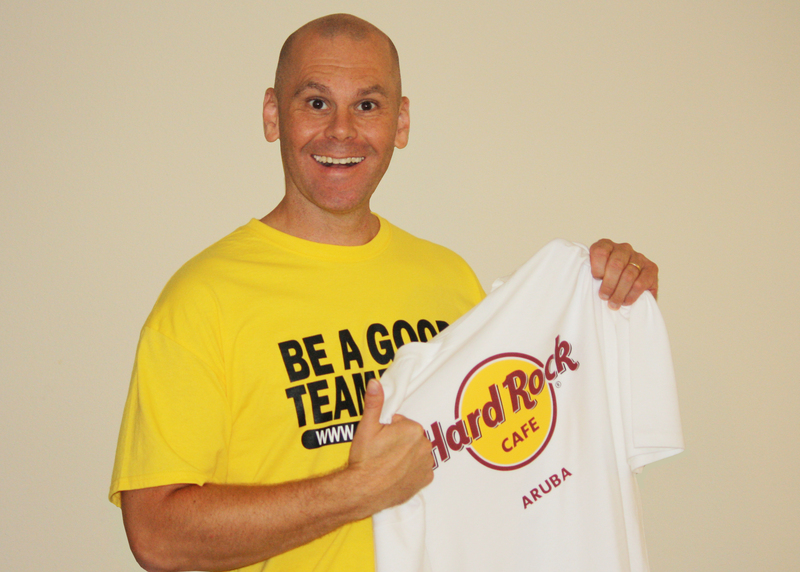 When we ate dinner at the Hard Rock Café-Aruba, I was very disappointed to discover that the gift shop was out of stock of the white classic t-shirts I collected. I explained my situation to the employee working the register, and she summoned the assistant manager. They apologized for the inconvenience and took my contact information with the promise to call me when they got the shirts back in stock. When I returned home, I sent an email to the Hard Rock Café corporate office about the situation and my disappointment. The next day, I got a response from one of their customer service representatives. Again, there was an apology for the inconvenience and they said they would have a member of the Aruba management contact me. Shortly after receiving that email, I did get an email from the general manager of the Hard Rock Café-Aruba. The manager offered the same apology for the inconvenience and promised to make arrangements for me to purchase a t-shirt via email as soon as their shipment was delivered—even though this is against their normal policy. Months passed, and I never heard from him or anyone else from the Hard Rock Café. I wrote it off as a life lesson and let it go. I recently moved into a new house and had to re-hang my Hard Rock Café t-shirts. In the process of doing so, I grew annoyed that I was still missing the Aruba location—a blemish to my collection. I decided to send another email to Hard Rock Café customer service department, after all, it had been well over a year since they promised to contact me. This time, the tone of my email was more reflective of my disappointment in the Hard Rock Café brand, and not just my inability to purchase a shirt. I wrote that particular sentence with complete sincerely because I really believed it. Within minutes of sending the email, I got a response from Fernando Davila, the Managing Director of the Hard Rock Café-Aruba, and from Giorgio Russo, the new General Manager. They again apologized and promised to get me a t-shirt ASAP. The next day, Esther, the Rock Shop Manager, requested my mailing address. A few days later, I got a courtesy call from Esther, just to let me know that Hurricane Maria was going to cause a slight delay in sending me the shirt, but to not fear because it would be going out in the mail as soon as possible. You already know how the story ends. So where is the good teammate lesson in all of this? Good teammates are people of action. They go above and beyond to protect the image of the team, and they do so without hesitation. In this instance, my problem was handled the moment it got into the hands of a good teammate. Fernando, Giorgio, and Esther were all good teammates. And I hope Hard Rock Café corporate realizes what assets they have in these individuals. They embodied the three inalienable characteristics of all good teammates—care, share, and listen. They listened to my problem, and they also viewed my problem as their team’s problem. They took a negative experience and turned it into a positive one. Their response built even more loyalty with me as a Hard Rock Café fan. Customer service is a team within the team, and every team has its own version of a customer service department. It’s those team members who are on the front lines, entrusted with the team’s reputation. The best teams make sure their best teammates are put into those positions. Those individuals are ultimately more than just ambassadors who control the team’s image, they control the team’s culture. A very heartfelt thank you to the Hard Rock Café’s customer service members for being good teammates and restoring my faith in their company—and the happiness I have come to associate with their t-shirts. Now, here’s your chance to be a good teammate and share. When we share something about ourselves, we empower others. We inspire them through this process. Do you have any collections? Take a moment to share what you collect with others. You may be surprised what good could come from your willingness to share. As always, remember: Good teammates care. Good teammates share. Good teammates listen. Go be a good teammate.